Twice in the last month I have spent the evening at Honest Farm store, taking cooking lessons from Susie Quick (yes, I think that is her real name!). I'm so bored with the menu options I come up with around here. I have wanted to simplify the process and make our meals more healthy at the same time. These lessons and the ones I hope to take in April are just what I needed. Especially at this time of year, when I am often in the barn most of the day, I end up not actually planning anything for dinner. Then before I know it, it's time to be putting it on the table. When that happens, I am most likely to fall back on the food I grew up eating----which is Kentucky country cooking. I love to cook and eat, and too much of that kind of cooking results in too much of me! For the first class Susie prepared chicken with lemon-green olive sauce, cous cous with lentils, a wonderful salad of mixed lettuces and lots of vegetables. And, for dessert, lovely little berry- yogurt parfaits. I recreated that meal at home for my husband a week later and we loved it. In my quest for healthier meals, I have resolved to get back into my garden this summer and grow lots of vegetables. In fact, I planted spinach a week or so ago and it is up and growing. 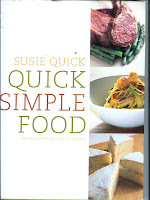 So anyway, Susie's book is "Quick Simple Food" and though it is no longer available in bookstores, I did find a barely used copy through Amazon and have been trying one or two recipes each week. I love that name, Susie Quick, I may have to steal that. I envy your cooking classes. I have to cook in bulk every single night. It is such an undertaking and my kids and husband eat soooo much. It is a crazy amount of food. I, too, get tired of my same old stand-by meals. I try to find new recipes every once in awhile to spice things up a bit. Hey, I loved catching up on your blog and that wall of wool is impressive and beautiful. Hope you are well.